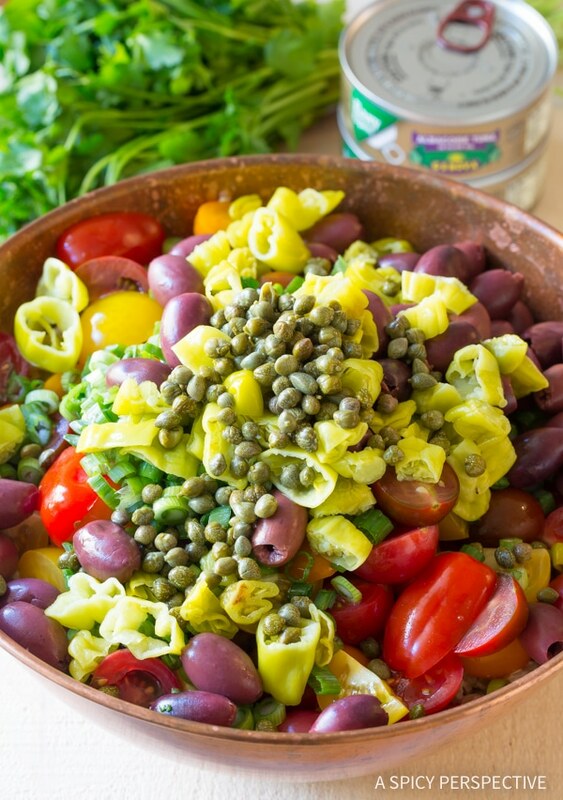 Tuna Pasta Salad with Olives and Capers, a delicate blend of Puttanesca and Nicoise flavors in one cold summer salad! Memorial Day may not mark the beginning of summer on the calendar, but it definitely signifies summer in our minds. This time of year we want to slow down, pull out our shorts, and turn up our beach playlist. We want to eat foods that remind us of vacations past, and sip tiki drinks with flamboyant garnishes. We want comforting, yet lighter, meals with bold flavors and textures. 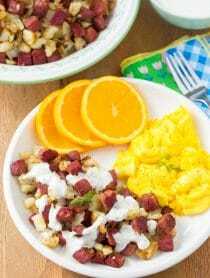 Foods that take little time to make and are great for impromptu picnics and summer parties. Today’s cool Tuna Pasta Salad with Olives and Capers is just the sort of dish I like to eat in the summertime. It offers fresh produce, tuna, anchovies, briny pickled olives, pepperoncini peppers, and capers. A clash of flavors that are reminiscent of both Italian Pasta Puttanesca, and classic French Nicoise Salad. 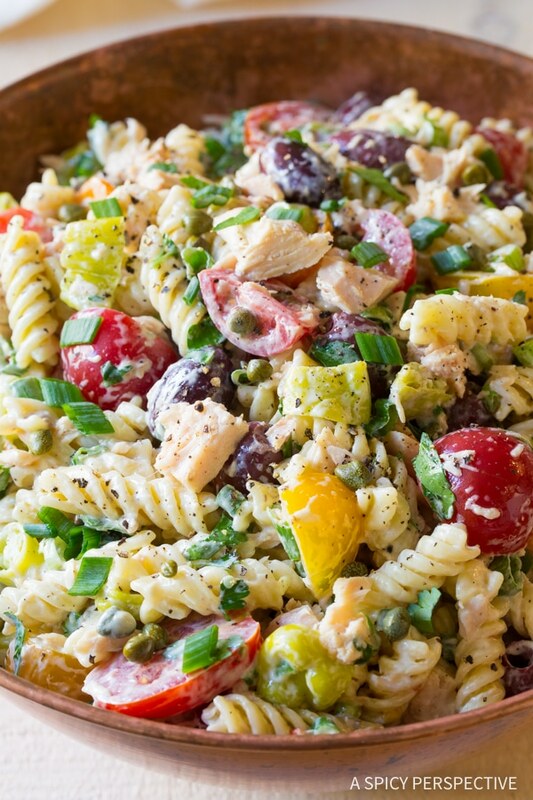 Plus, Tuna Pasta Salad with Olives and Capers can be served as either a main dish or as a side dish! Although the pickled ingredients offer a lively pop of flavor, it’s the tuna that is the real star of this dish. I mixed Genova Albacore Tuna in Olive Oil into the pasta. 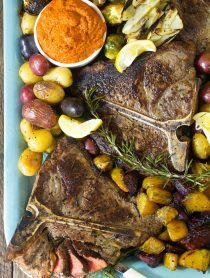 It provides a delicate clean seafood flavor, and firm meaty texture. Cooking with Genova tuna makes it easy to add lean protein to a recipe, for a well rounded meal. 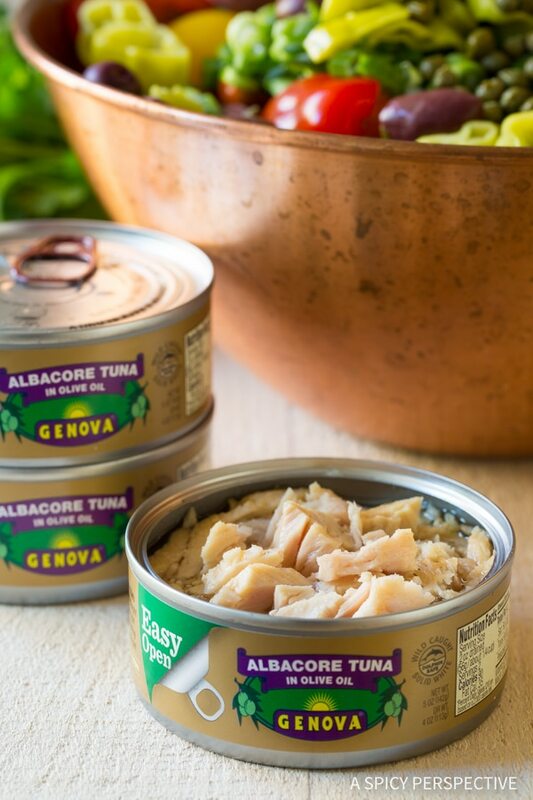 Genova tuna tastes delicious, comes in an easy-open can, and is super high quality with essential nutrients, and less fat than chicken and beef! 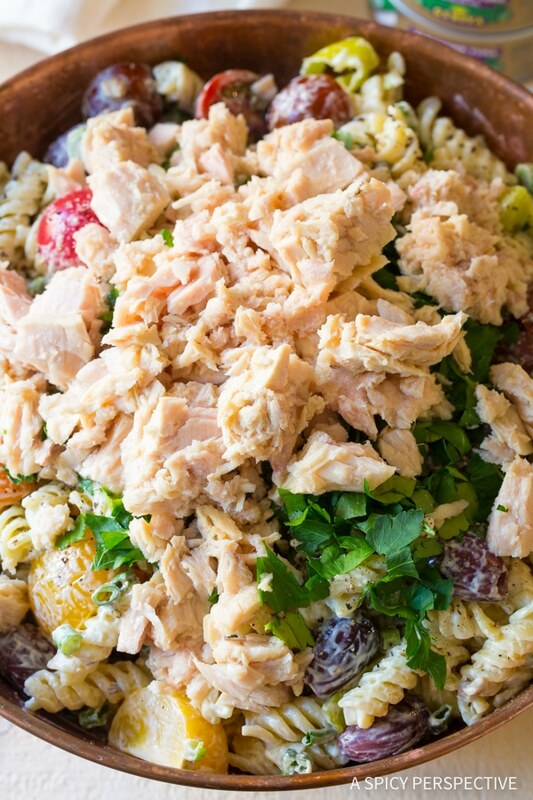 Albacore tuna is the perfect protein to complement to the briny ingredients in this Tuna Pasta Salad with Olives and Capers. Boil fusilli pasta. Then rinse the pasta in cold water and pour the pasta into a large salad bowl. 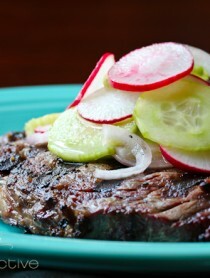 In a small bowl, mix the mayonnaise, dijon mustard, and anchovies for the dressing. 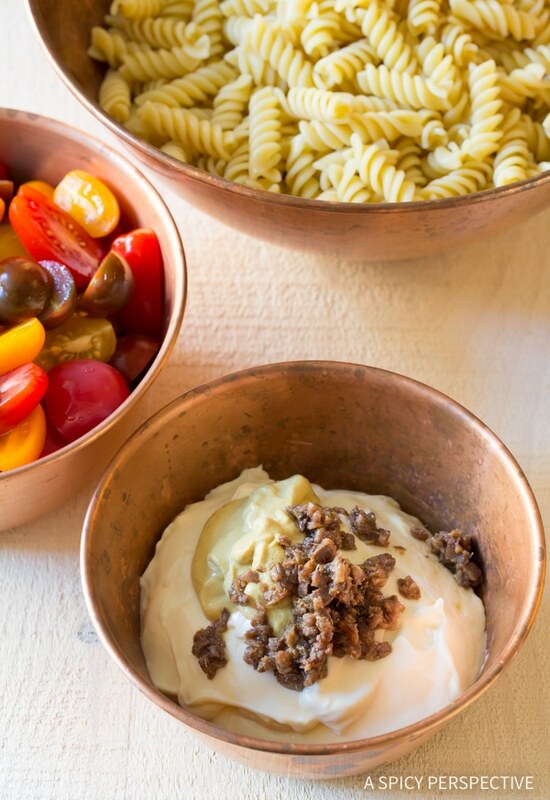 Pour the mayonnaise dressing over the pasta and toss well to coat. Then add Genova Albacore Tuna, tomatoes, scallions, olives, pepperoncinis, parsley, and capers. Gently toss to mix. 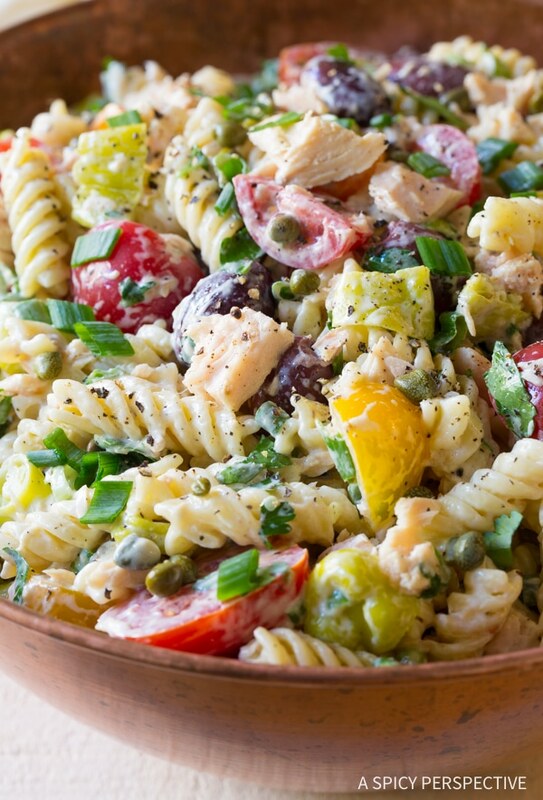 You are going to love this Tuna Pasta Salad with Olives and Capers. It’s fast, fresh, and flavorful! Interested in finding out more about Genova Tuna? Where Was My Tuna Caught? What Fishing Vessel Caught My Tuna? Where was My Tuna Processed and Canned? Disclosure: This post is sponsored by Genova Seafood. All opinions are our own. 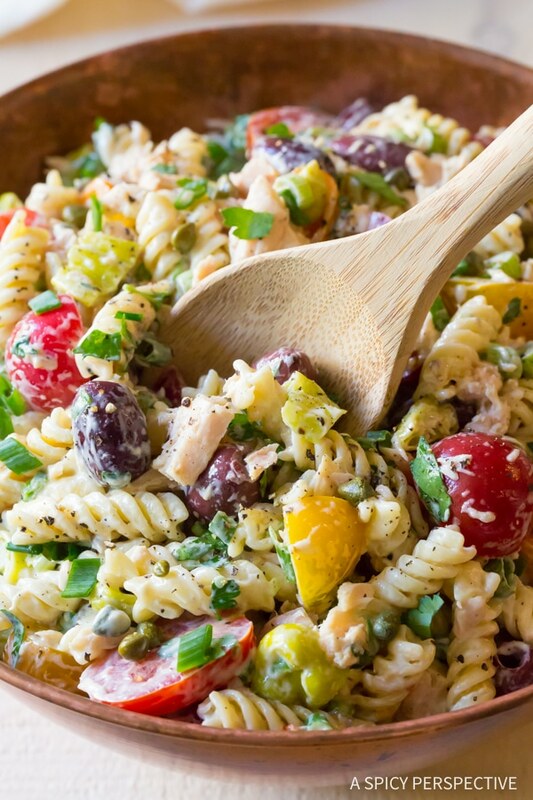 Tuna Pasta Salad with Olives and Capers - A delicate blend of Puttanesca and Nicoise flavors in one cold summer pasta salad! Set a large pot of water over high heat. Once boiling, add 1 tablespoon salt and fusilli pasta. Stir once, then cook according to package instructions. Drain the pasta and rinse with cold water. Shake off the excess water. Then pour the pasta into a large salad bowl. Meanwhile, prep the produce. In a small bowl, mix the mayonnaise, Dijon mustard, and anchovies. Pour the mayonnaise dressing over the pasta and toss well to coat. Then add the tuna, tomatoes, scallions, olives, pepperoncinis, parsley, and capers. Gently toss to mix. Taste, then salt and pepper as needed. Cover and chill until ready to serve. Now THIS is what I call a pasta salad! 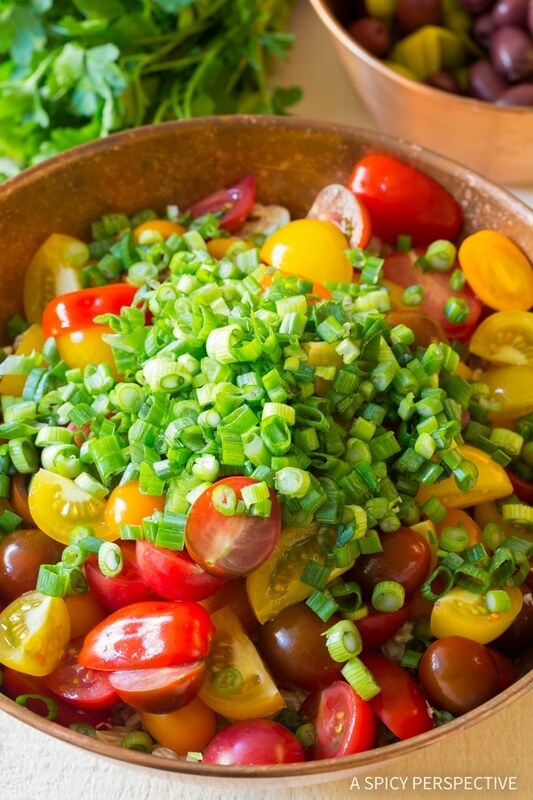 Perfect salad for a summer BBQ!